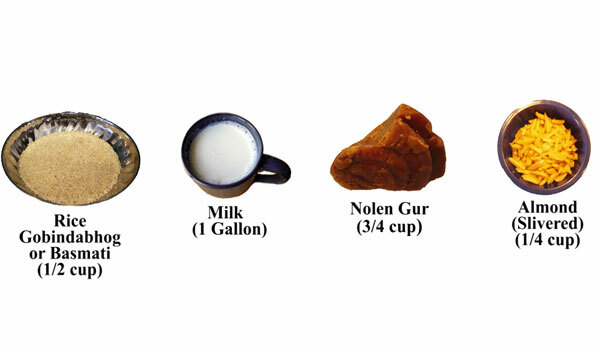 In the Bengal region, Payesh with the season’s first nolen gur (or jaggery) with aromatic Gobindabhog rice and milk is the offering of choice during ceremonies such as Nobanno (New Harvest festival) and Annaprasan (a child’s food initiation ceremony). 1) Wash the rice and set it aside. 2) Heat a gallon of milk in a thick bottomed sauce pan on a High setting. Stir continuously so it does not burn at the bottom. 3) If the milk comes to a rolling boil, turn down the heat to a medium setting. Continue heating and stirring till the milk becomes about 3/4th the original volume. 5) Then add the jaggery, broken into small pieces. 6) Continue stirring till the jaggery mixes completely. 7) Then turn off the stove. 8) To prepare the almonds, roast them on a skillet until they turn a little brown. Turn off the heat but continue stirring, and the almonds will be fully roasted in the remaining heat. 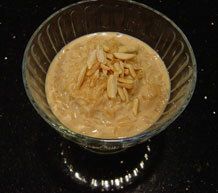 9) Sprinkle the roasted almonds on the cooled Payesh and enjoy!